Heimdall is the sentry of Asgard and a member of the Aesir (the gods of the Norse pantheon). 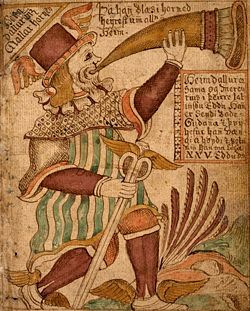 His most important function within Norse mythology is to herald the coming of the apocalypse (Ragnarök) by sounding his majestic trumpet (Gjallarhorn) and leading the Aesir into their final battle. Heimdall is known for his hyper-acute senses (particularly his hearing) and for his antipathy towards Loki, who he will die fighting during the battle of Ragnarök. In some scholarly accounts, parallels have been drawn between Heimdall and the Vedic deity Dyaus, and also between Heimdall and the Christian archangel Michael (see below). As a Norse deity, Heimdall belonged to a complex religious, mythological and cosmological belief system shared by the Scandinavian and Germanic peoples. This mythological tradition, of which the Scandinavian (and particularly Icelandic) sub-groups are best preserved, developed in the period from the first manifestations of religious and material culture in approximately 1000 B.C.E. until the Christianization of the area, a process that occurred primarily from 900-1200 C.E. As Thomas DuBois cogently argues: “[w]hatever else we may say about the various peoples of the North during the Viking Age, then, we cannot claim that they were isolated from or ignorant of their neighbors…. As religion expresses the concerns and experiences of its human adherents, so it changes continually in response to cultural, economic, and environmental factors. Ideas and ideals passed between communities with frequency and regularity, leading to and interdependent and intercultural region with broad commonalities of religion and worldview.”  The tales recorded within this mythological corpus tend to exemplify a unified cultural focus on physical prowess and military might. Heimdall is described as the sentry of the Aesir, guarding Asgard against the depredations of the Jotun (giants). In this illustration from a seventeenth century Icelandic manuscript, Heimdall is shown guarding the gate of Valhalla. First and foremost, Heimdall is described as the guardian of Asgard, the sentry encamped upon Bifrost (the rainbow bridge) who will sound his majestic trumpet (Gjallarhorn: "The Ringing Horn") to warn the Aesir of any approaching danger. This duty is most often recalled in descriptions of the end times (Ragnarök), when the peals of the Gjallarhorn will summon all of the gods to their final conflict with the beasts and the Jotun (giants). Heimdallr is the name of one: he is called White God. He is great and holy; nine maids, all sisters, bore him for a son. He is also called Hallinskídi ["Ram"] and Gullintanni ["Golden-teeth"]; his teeth were of gold and his horse is called Gold-Top. He dwells in the place called Himinbjörg ["Heaven-fells"], hard by Bifröst: he is the warder of the gods, and sits there by heaven's end to guard the bridge from the Hill-Giants [Jotun]. He needs less sleep than a bird; he sees equally well night and day a hundred leagues from him, and hears how grass grows on the earth or wool on sheep, and everything that has a louder sound. He has that trumpet which is called Gjallar-Horn, and its blast is heard throughout all worlds. Heimdallr's sword is called Head. Heimdall was, for reasons that have been lost to history, associated with sheep and rams. This explains some of his sobriquets, from the most overt ("Ram") to the more indirect ("Golden-teeth," with the theory being that his teeth were thought to have the same yellow sheen as an older ram's). Likewise, this also explains why his sword would have been called "Head," as the head presents the exact location of a ram's offensive weapons. 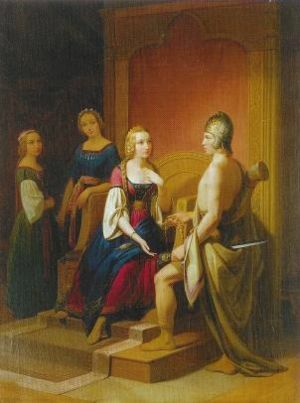 One of the most confounding elements of Snorri's account is the depiction of Heimdall as the son of nine mothers (with the father generally thought to be Odin). Further, two different sets of nine mothers are suggested in the Eddic poetry: nine related giantesses and the nine daughters of Aegir (the personification of the sea). This blatantly impossible lineal situation has presented a puzzle to folklorists and scholars of religion for some time. However, Georges Dumézil, a noted comparativist, has found a reference in Welsh folklore that could present a solution to this puzzle. Specifically, he discovered in the Welsh corpus a reference to the characteristics of particular waves, with every wave being called a "ewe" and the ninth being called a "ram." We understand that whatever his mythical value and functions were, the scene of his birth made him, in the sea's white frothing, the ram produce by the ninth wave. If this is the case, then it is correct to say that he has nine mothers, since one alone does not suffice, nor two, nor three. An exact succession of nine is necessary to produce him, and the ninth one, if she is the only one to beget him, begets him only because there are eight well-counted ones before her. In this way is best explained the singularly analytic expression of the Húdrápa, which calls Heimdall "son of one and eight waves." This theory, if correct, simultaneously accounts for Heimdall's nine mothers, his association with rams, and the appellation "White God" (which could have been derived from the white froth on the tips of these waves). In an intriguing parallel to Odin's sacrifice of one eye for the ability to see the future, it appears that Heimdall sacrificed one of his magical ears (his most notable asset) in order further extend his own super-human sensory abilities. The various traits and examples listed above are sufficient to represent Heimdall in both his simplicity (his undisputed role as guardian of Asgard) and his complexity (his various, often confounding attributes). Such issues can largely be attributed to the paucity of source materials. The Prose Edda makes specific mention of two texts (the Heimdallargaldr and the Húsdrápa) which provide detailed descriptions of the nature and adventures of the White God. Unfortunately, only fragments of either text have survived, with the remnant of the Húsdrápa presenting an intriguing story of a battle between Heimdall and Loki (who had both taken the form of seals). In this particular account, the two were fighting because Heimdall agreed to recover a piece of magical jewelry that Loki had stolen from Freya. Regardless of the vagaries of this (mostly vanished) context, this rivalry provides foreshadowing for the ultimate conflict between these two deities (described below). Heimdallr blows into Gjallarhorn in this illustration from an eighteenth century Icelandic manuscript. Georges Dumézil, using examples from Vedic mythology and the Indian epics (especially the Mahabarata), argues that Heimdall represents the pattern of "first gods" or "framing gods": beings that help define the pantheon (and the cosmos) through their existence at its boundaries. This view of Heimdall as a liminal figure helps to account for many otherwise puzzling elements of the god's characterizations, including his lineage, the location of his dwelling-place, his place in the mythic timeline, and his complicated relationship with humanity. Like the other Vanir, he knew the future well. While on one hand, this seems to imply a fairly direct lineal connection between the watchman God and the second class of Norse divinities, the word translated as "other" could also rendered "even," which would mean instead that Heimdall had foresight "even" as do the Vanir. Regardless, this passage indicates a certain ambiguity with respect to Heimdall's place in the Norse pantheon. Heimdall exists at the periphery of Asgard, living "at the edge of the world, at the foot of the rainbow, but his palace is above the skies, in the Himinbjorg... The rainbow is the path that joins the limit of the horizon to the center of the sky; it is from above the sky at the top of the central axis, that the watch-god watches the whole circumference of the world." In this way, he exists on the boundary of the divine and human worlds - seeing all but generally abstaining from interfering. In many accounts, including the Prose Edda, Heimdall is described being "born at the beginning of time." However, after his role sounding the clarion call of the apocalypse (Ragnarök), Heimdall is described as the last of the gods to perish, as he and Loki are destined to slay one another. This is the clearest instance of Dumézil's "framing" role, as the deity can be seen to bookend the entirety of cosmic history. More explicitly, the poetic Rígsthula identifies Heimdall as the originator of stratified human society, where the god is described sleeping with three different human couples (named "Great-grandfather" and "Great-grandmother"; "Grandfather and Grandmother"; and "Father and Mother"), with the progeny emerging from each union corresping to the classes of human society (including laborers, warriors and royalty). In this instance as well, Heimdall can be seen as an interstitial figure, helping to create divisions without being part of them himself. Dumézil suggests that Heimdall is related to the Hindu god Dyaus (one of the eight Vasus) who was reincarnated as the hero Bhishma in the epic Mahabharata. Supporting this conclusion, he draws upon the respective roles of each character as "framing deities" - helping to define the context and bounds of the cosmologies of which they are a part. For example, Bhishma never held power himself, acting instead as an ageless uncle on behalf of the line of lords that tortuously descend from his half-brothers, including the Pandava brothers who represent four classes of society: royalty, noble warrior, lower class club-bearing warrior, and herdsmen. Strong parallels can be seen between this account and the generative myth of Heimdall in the Rígsthula (described above). Also like Heimdall (in his role at Ragnarok), Bhishma is the last to die in the great battle of Kurukshetra. Many readers have found the holy watchman, blowing his horn at the end of the world, alien to Norse heathendom. He is reminiscent of the Archangel Michael who, according to a Christian legend widespread in the Middle Ages, will awaken the dead with the blast of his trumpet. In the Norwegian visionary poem, Draumkvæde, probably of the thirteenth century, Saint Michael appears mounted on a white horse, as Heimdall once appeared on his splendid Gulltoppr (Golden Forelock)…. In the Draumkvæde Michael faces Grutte Grey-beard, who rides from the north, mounted on a black [horse], wearing a black hat. Grutte is perhaps the diabolical Odin. According to Snorri, the shining white Heimdall will face Loki, archenemy of gods and men. Despite these parallels, it must be noted that Heimdall was definitely a member of the Norse pantheon, with a long and storied history (notwithstanding the fact that much of it has been lost). As such, any Christian attributions would simply be syncretic additions: for example, it is in fact quite logical that the divine sentry would be responsible to sound the warning of the approaching apocalypse. ↑ John Lindow. Handbook of Norse mythology. (Santa Barbara, CA: ABC-CLIO, 2001), 6-8. Though some scholars have argued against the homogenizing effect of grouping these various traditions together under the rubric of “Norse Mythology,” the profoundly exploratory/nomadic nature of Viking society tends to overrule such objections. ↑ Thomas A. Nordic. Religions in the Viking Age. (Philadelphia: University of Pennsylvania Press, 1999), 27-28. ↑ More specifically, Georges Dumézil, one of the foremost authorities on the Norse tradition and a noted comparitivist, argues quite persuasively that the Aesir / Vanir distinction is a component of a larger triadic division (between ruler gods, warrior gods, and gods of agriculture and commerce) that is echoed among the Indo-European cosmologies (from Vedic India, through Rome and into the Germanic North). Further, he notes that this distinction conforms to patterns of social organization found in all of these societies. See Georges Dumézil's "Comparative Remarks on the Scandinavian God Heimdall" in Gods of the Ancient Northmen, Edited by Einar Haugen; Introduction by C. Scott Littleton and Udo Strutynski. (Berkeley: University of California Press, 1973), xi-xiii, 3-25) for more details. ↑ Snorri Sturluson, Gylfaginning (XXVII), (The Prose Edda. Translated from the Icelandic and with an introduction by Arthur Gilchrist Brodeur. New York: American-Scandinavian foundation, 1916), 40. ↑ Gabriel Turville-Petre. Myth and Religion of the North: The Religion of Ancient Scandinavia. (New York: Holt, Rinehart and Winston, 1964), 151. ↑ Dumézil, 135. All emphases original. ↑ Turville-Petre, 150; Lindow, 170. ↑ Lindow, 167-170. See also Snorri: "The tale thereof is told in Heimdalar-galdr … Ulfr Uggason [also] composed a long passage in the Húsdrápa on that legend, and there it is written that they were in the form of seals." Skáldskaparmál (VIII), (Brodeur, 113). ↑ In addition to Davidson's book, this passage is also quoted and explored in Lindow, 170. ↑ See Turville-Petre for a further discusses of this liminal element in the mythic characterization of Heimdall (154). ↑ Jan de Vries, quoted in Dumézil, 130. ↑ Andy Orchard Dictionary of Norse Myth and Legend, 2nd Revised. (London: Cassell; New York: Distributed in the United States by Sterling Pub. Co., 2002), 80. ↑ Quoted in Lindow, 169. ↑ Lindow, 169; Turville-Petre, 150. Branston, Brian. Gods of the North. London: Thames and Hudson, 1980. (Revised original 1955). ISBN 0500271771. Davidson, Hilda Roderick Ellis. Gods and Myths of Northern Europe. Baltimore: Penguin Books, 1964. Dumézil, Georges. "Comparative Remarks on the Scandinavian God Heimdall" in Gods of the Ancient Northmen. Edited by Einar Haugen; Introduction by C. Scott Littleton and Udo Strutynski. Berkeley: University of California Press, 1973. ISBN 0520020448. Sturlson, Snorri. The Prose Edda of Snorri Sturluson: Tales from Norse Mythology. Introduced by Sigurdur Nordal; Selected and translated by Jean I. Young. Berkeley, CA: University of California Press, 1954. ISBN 0520012313. Snorri Sturluson. The Prose Edda. Translated from the Icelandic and with an introduction by Arthur Gilchrist Brodeur. New York: American-Scandinavian foundation, 1916. Sayers, William (1993). "Irish Perspectives on Heimdallr". (PDF) Alvíssmál 2. Freie Universität Berlin. ISBN 3861356015. This page was last modified on 12 December 2017, at 17:46.